My passion is traveling the world and searching out unusual experiences. On a recent trip to Turkey, after several wondrous days in Istanbul, I wanted to try something a little different. I had dreamed about visiting Cappadocia, an enchanted place on the fabled “Silk Road” in central Turkey where stones sprout from the ground like mushrooms, cities are carved from mountains, and the winemakers have been plying their trade since before the 4th century B.C. I also wanted to enjoy a uniquely authentic Cappadocian experience, so I arranged to stay in one of the regions’ best cave accommodations; the Taskonaklar Hotel. 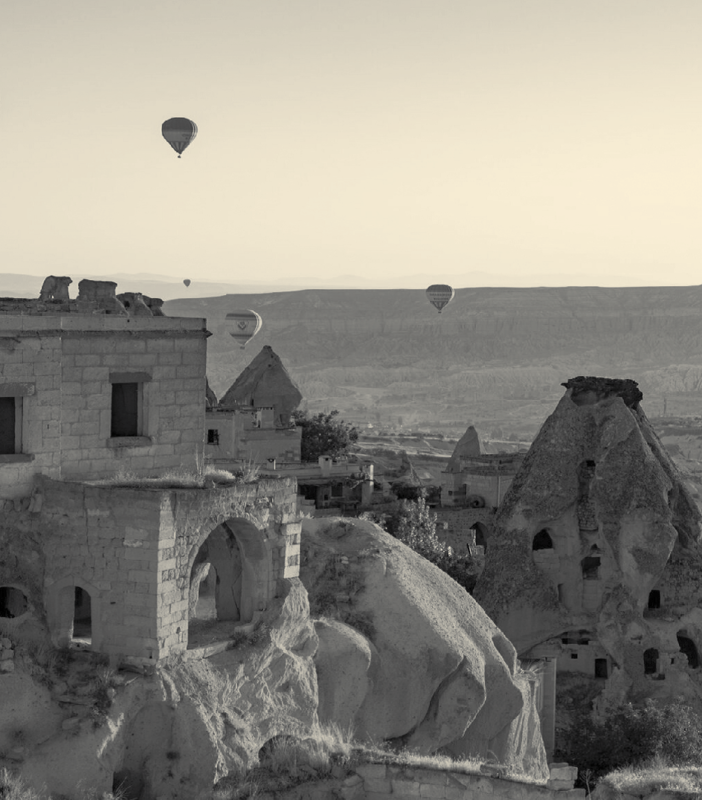 The thought of staying in a cave—a cold, damp, musty chamber with no light—is not on the surface very appealing, but I deferred to my friends who had visited Cappadocia and said that staying in one should be at the top of my list of things to do. As I drove my rental car from Kayseri, through the legendary landscape of the Anatolia, I found myself traveling in a surreal painting of crumpled, terra cotta colored hills pierced by cream-colored spires. This was not the place of my dreams; it exceeded them. In the distance, I could see Uçhisar, my destination. This citadel of barren rock, the highest point in Cappadocia, towered over the surrounding plains. Just below the summit, carved into the solid rock, I could see dozens of windows peering over the surroundings, with the city itself spilled further below surrounding the fortress. I navigated my car through absurdly narrow alleyways and finally found the small sign announcing the Taskonaklar Hotel. carved into the rock. Others had hot tubs with unimpeded views of the landscape. On the surface, thoughts created when you think “cave hotel,” don’t inspire luxury or even comfort, but once again, travel has altered my expectations. Not only did I get a huge helping of unique, I also received a generous measure of luxury, which I couldn’t have imagined from a cave before. Editor’s Note: Jonathan Look, Jr. writes about life, retirement, and travel at his website LifePart2.com. Thank you Jon for your lovely article! !